Starling Fitness - Fitness, diet, and health weblog » It’s Not Hunger. It’s The FEAR of Being Hungry. It’s Not Hunger. It’s The FEAR of Being Hungry. I knew he was right, but I still felt it was like a risky thing. I wanted to binge on the Krispy Kreme Donuts and Popcornopolis that we walked past to get to the Excalibur Buffet. 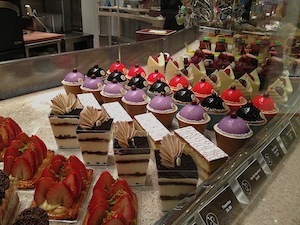 When we walked into the buffet, the FIRST thing I saw was the array of desserts. And suddenly, the hunger dissipated and the fear of a binge evaporated like water in a dessert. It was time for me to eat, my alarm had gone off about thirty minutes ago, but that terrifying hunger and desire to binge went away. It went away because it wasn’t hunger. It was the FEAR of being hungry. My body knew that I was going into that mode of starving myself because I looked at the food court and told it that there was nothing there that I could eat. It fought back the only way it could, by telling me that it really was very hungry, and I MUST feed it. Begging not to be starved, like with so many diets in the past, my body was scared that I was going to get hungry, which, ironically, made me hungry. The moment I paid my buffet money and walked past the beautiful collection of desserts, it realized that I was going to feed it and backed off. It was amazing. At the buffet that night, I ate a piece of fish, some cantaloupe, a 1/4 cup of quinoa salad and one wonton. I easily kept my calories within my limits and I did just fine. And the next day, I bought the decadent wristband that lets you go into the buffet as many times as you want eat all day long for one price. That wristband was a constant reminder that if I was hungry, all I had to do was walk to one of the two buffets nearby and eat. I easily stayed under my calories all day. It’s not hunger that makes me binge. It’s the FEAR of hunger that makes me binge. After years of dieting, it’s no wonder that my body and psyche are terrified of being starved, because I WAS starved by my own volition. Buying the all day wristband, ensured that I wouldn’t go hungry that day and made eating healthy easier. The next time you feel a binge coming on, remember that and FEED yourself properly. Make sure you are eating enough and you will curb your binges dramatically.